1. Any yearbook purchased online is eligible to receive 4 free additonal pages for custom personalization. See Ms. Nutting for further information about any of these promotions. Are you looking to own the memories from this year? Do you want to complete your collection because you are missing a year or two? Below is where you can access the yearbook from this year and past yearbooks starting with 2017. 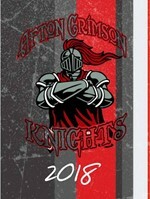 Click on the picture of the yearbook to order the current yearbook or yearbooks from previous years. You can create a special message for your senior which will add that personal touch for them in their yearbook. If you are interested in placing a congratulations ad in the yearbook, please fill out the congratulations ad form that can be found on the right hand side of this page. The cost is $15.00 and that is for 1/6 of a page. If you would like to purchase more space than that, just indicate so on your paper. The link for the paper can be found under forms on the right side. Deadlines for the ads are April 30. If youy have any questions please contact Ms. Nutting at 607-639-8200 or by email - knutting@aftoncsd.org. Send your senior a special message in the yearbook. Fact sheet to be filled out by each senior. A video about how getting Skipple can help the yearbook! -Skipple is an app to upload pictures from the year that can be used in the yearbook. -Click on the picture to download the app.